When Rosemary Nolan told her parents she was a lesbian, her father’s only worry was that he wouldn’t get to have grandchildren. Boy, did she prove him wrong. 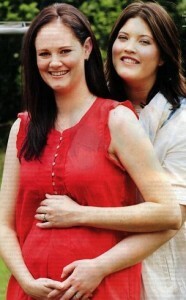 Rosemary and her partner Melissa Keevers are currently expecting quintuplets! They must be dodging reality TV offers left and right. The couple, who make their home in Brisbane, Australia, already have a one-year-old daughter named Lilly. Melissa gave birth to Lilly after being inseminated by donor sperm. The same donor was used to conceive the quints. What makes this pregnancy particularly amazing is the fact that Melissa was not undergoing any fertility treatments when she conceived. The odds of a quintuplet pregnancy are one in 60 million, so you can imagine the couple’s surprise when their doctor gave them the news. Both women are wrestling to anticipate the impact five new personalities will have on their family but their most immediate concern is for the health of Melissa and the babies. So far, everything is going well. All of the babies are growing beyond expectation and have strong heartbeats. Rosemary has a twin herself and looks forward to watching her children form the same special bond she shares with her sibling. With a little luck, in no time at all, the couple will be burning through 70 diapers a day and wheeling their brood around town in a deluxe model stroller for six; what an exciting challenge!– Jen R, Staff Writer. Masche Sextuplets Invade The Today’s Show!